The family Leguminosae (legumes) includes beans, peas, lentils, peanuts, carob, tamarind and Acacia and many other trees. Their use as a source of food is second only to the cereal grains. The common bean Phaseolus vulgaris (vulgaris is Latin for common) is a member of this family, and Black beans are one of hundreds of varieties of the common bean. 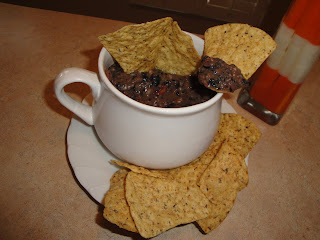 Black beans are used dried; originally the drying of beans was a way to ensure a winter food supply, as beans can be successfully dried and stored for up to a year, with hardly any fear of deterioration or damage. 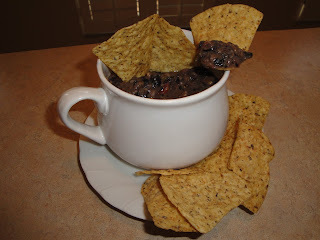 Black beans grow best at temperatures between 65 and 75 degrees F. They are a warm season crop, requiring up to 120 days to reach maturity and dry. The beans are left on the plants to dry, so humidity and heat can cause damage to the beans as they are drying on the plant, and rain can be a problem during the drying and curing process. They are harvested by machine, and the plants themselves left as 'green manure'. Mix all ingredients in a large bowl. Use immersion blender, puree beans. Cover and chill until ready to serve. Enjoy! Note: If you don't have a immersion blender, use your food processor, that will be fine. I'm a home made hummus addict, so this is just my style! Hey Sandra, I love cumin. It has a smoky flavor. I always use cumin when I make chili. I tend to forget about black beans and I think I have some on hand. Perfect for Cinco de Mayo, although I wouldn't limit something this good to just one day of the year. I love how healthy this dip is!! I love that! Looks yummy! A healthy alternative to a creamy dip, very nice!